Special Containment Procedures: SCP-2341 and the surrounding terrain are to be constantly monitored by Site-48 extension Security Post-2341. Any non-Foundation personnel attempting to enter SCP-2341's containment area are to be detained and reported. Any spontaneous anomalous activity from SCP-2341 is to be logged. Mobile Task Force Zeta-7 (“Homestead”) are to keep non-Foundation personnel from traveling to SCP-2341. The containment area is to be surrounded by an electric fence. 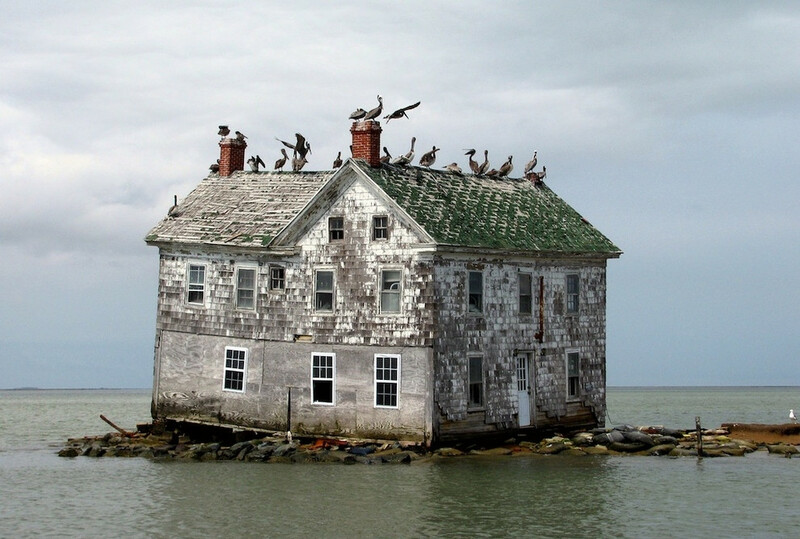 Description: SCP-2341 is an abandoned two story house located on a small sand bank between Little Thatch Island and Phillis Island, Cape Cod. The condition of the structure's exterior indicates exposure to the elements for a prolonged period of time. The interior, when viewed through the windows, is heavily fire-damaged and shows no signs of recent habitation. SCP-2341’s anomalous properties activate only when a human subject older than 18 years of age opens the front door. Only one subject at a time can enter1, but cannot leave until the anomalous events have concluded. The door will also remain closed if the house is already occupied. When entering SCP-2341, the interior will reshape itself to look identical to the home that the subject had lived in for the first 18 years of life. Outside observation through the windows will be blocked by the curtains inside of SCP-2341. SCP-2341's interior change, during its anomalous effects, does not correspond with external geometry of the house. Subjects that had moved during this time period will enter the home that they lived in the most. The subject will then encounter a variable number of SCP-2341-1 instances. These instances will bear the exact appearance of all the subject’s immediate family members as well as former household pets. Subjects that have grown up with an adopted or foster family will encounter SCP-2341-1 instances based on their surrogate family rather than their biological one. SCP-2341-1 instances that resemble deceased family members are aware of the original counterpart's current condition, but will not treat their appearance as an irregular occurrence. Subjects will remain in SCP-2341 for approximately 8.5 hours regardless the time of entry. At the end of the visit within SCP-2341, all SCP-2341-1 instances and the subject will prepare for sleep. Once the subject has fallen asleep, they will be teleported to and will wake up at the front door of SCP-2341. It has been noted that references to an entity by the name of “Peter” have been present in various SCP-2341-1 conversations. Currently, no known information has been discovered about this person. As of █/█/2015, subjects have witnessed a humanoid entity (designated SCP-2341-2) during their stay inside of SCP-2341. Subjects perceive SCP-2341-2 as either an older child or young adult (Ages observed range between approximately 10 to 18 years of age). Sightings consist of brief glimpses of SCP-2341-2 before the entity moves out of the subject’s line-of-sight. Attempts to follow the entity have so far proven futile. Subjects can detect when SCP-2341-2 is nearby from loud aggravated grunts and crying. See also Addendum 2341.2. Addendum 2341.1: Through testing of D-Class personnel, it has been discovered that the events which take place within SCP-2341 will always follow a specific pattern. The pattern of events has been recorded in the table below. 1 hour – 2 hours SCP-2341-1 instances greet the subject and welcome them back to their home after having been away for an extended period of time. Afterwards, the subject and the SCP-2341-1 instances engage in casual conversation on topics such as current events and life situations. 2 hours – 3.2 hours An SCP-2341-1 instance, often the mother of the subject, calls for everyone to put on a “performance.” This will include showing special talents from other family members i.e. playing musical instruments, acting, singing, or any means of entertainment. 3.2 hours – 4 hours An SCP-2341-1 instance announces that dinner has been made. All instances and the subject will gather around the table. A prayer2 will be spoken before eating the served food. 4 hours – 7 hours All instances will help clean up the table and the dishes. As soon as this task is complete, the family members start various activities independently or with other instances. Most activities consist of either hobbies or group-oriented games. The subject can choose which activity to partake in, but cannot leave SCP-2341. 7 hours - 8.5 hours SCP-2341-1 instances will begin preparing for sleep after activities have been completed or have grown tired. Toiletries such as facial cream or retainers are present for the subject to use. Afterwards, once the subject has entered their room, they will enter sleep and will be teleported to the front door of SCP-2341. On █/█/2015, Researcher Andrew proposed sending a drone into the interior of SCP-2341 while the front door of SCP-2341 is open in an attempt to see the original interior of SCP-2341. The proposal has been authorized. The drone is sent in as Agent Saggio holds open the door. The camera feed shows the house to be burned with some patches of corrosion on the walls and floors. Approximately seven centimeters of water cover the floor. A sound believed to be human weeping can be heard originating from the living room. The drone moves toward the source of the noise while avoiding the water so as to not become damaged. The drone enters the living room. Analysis of the noise seems to indicate both an adult and adolescent male weeping in unison. Positioned in the middle of the living room is a grey humanoid3 in a fetal position, as well as two burnt cadavers. The drone approaches the humanoid until the feed cuts to static, with the continued sound of crying from the humanoid. 1. If a subject 18 and older brings a second subject within, the first subject will enter successfully, but the second subject will be teleported outside of SCP-2341 and the door will close. 2. Prayers can change depending on what religion the subject follows, and are only present if the subject has religious affiliation. 3. Speculated to be SCP-2341-2.